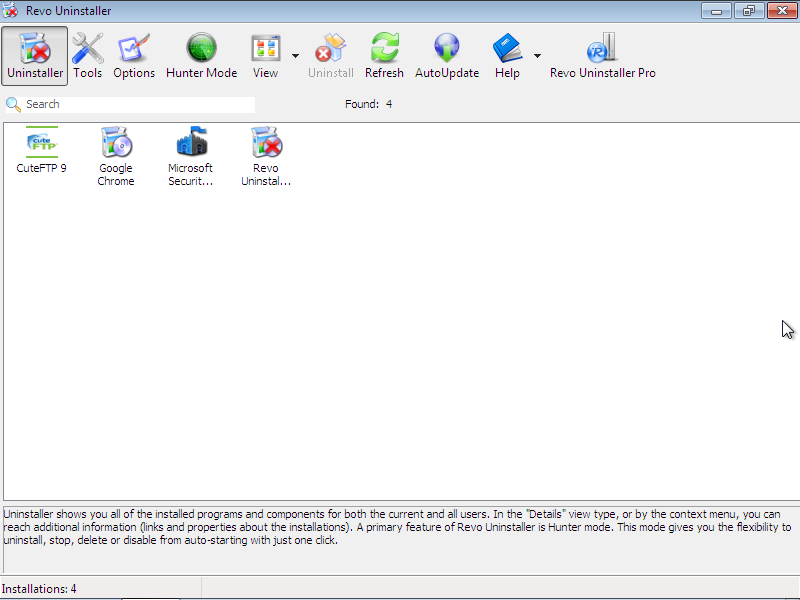 Revo Uninstaller Free Download latest version 1.95 for Windows 32/64 bit. Get Revo Uninstaller offline setup, standalone installer. Revo Uninstaller Freeware is a well built software uninstaller which is more faster than the Windows standard uninstaller. His performance is great because it uses a intelligent method to detect what files a application installed on your computer and what settings were made. Any leftovers like addional files, folders and registry keys will be deleted to avoid slowing down your computer. Almost every software on the Internet forgets to delete all their trace when the uninstall is finished so you will end up having to delete them manually or using a uninstaller. Revo Uninstaller uses a performant module called “Hunter Mode” to uninstall desired applications and to identify files and extra registry keys that were left by the software. The User Interface has a slick design with buttons for every function of the program. All of them are at the top of the main window. YOu will find the Uninstaller button which displays all software installed on your computer. 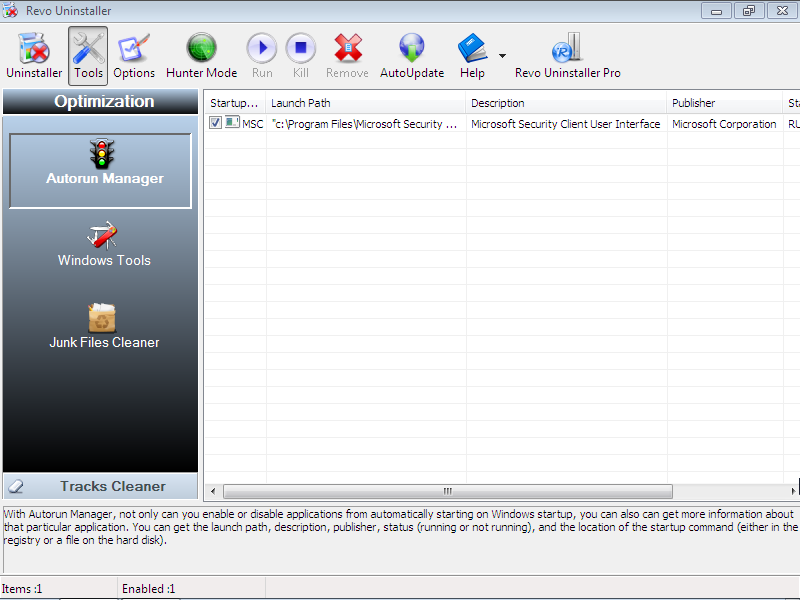 You can also access the options and further customize the behaviour of the Revo Uninstaller Freeware. If you get stuck and have problems understanding what a certain function means you can use the Help library displayed in the main window. Access the Hunter Mode and you will benefit from one click uninstall function. Use the target icon to aim at programs which are on your desktop, quick launch bar or launched applications to stop, delete or uninstall them. Another fast way to uninstall a program is to drag their launch exe or shortcut over the Revo Uninstaller window. Use this method if you have too many installed applications and you don’t want to search in the Uninstaller list for the app you want to uninstall. Inside the Tools tab you will find extra interesting tools that are designed to help cleaning your computer folders and registry. You will find tools like AutoRun Manager which gives you full control over applications that are launched on Windows startup. Extra components and features are present in Revo Uninstaller Pro Download on our website. Intelligent scanning engine to find files, folders and registry keys which are left by an uninstalled application. Intuitive User Interface: all main fuctions of the application are displayed at the top of the main window. The Hunter Mode: easy and fast way to uninstall programs just by using drag and drop or clicking them with the target icon. Extra tools: 8 of them to further provide ways to check for unused files, registry keys and to manage programs that start after the Windows OS is loaded. OS: Windows XP SP3, Vista, 7, 8, 8.1, 10 and Windows Server. Click the link below to start the Revo Uninstaller Download Latest Version 1.95. If you have any problems while downloading please leave a comment below. After the page opens remember to choose the “Download through your browser” option to start downloading Revo Uninstaller Offline Installer, Standalone Setup.